The perfect back to school treat! We had the girls, Jenna Lawless and Lauren Ewald from Top Town Treats come teach a cake pop class at Sweet!. Bake your favorite cake in a 9″ X 13″ pan. Trim outside edges and the top and bottom to remove any dark dry pieces of cake. This step is really important if you are using a light colored cake. Cut cake into squares. Rub two squares of cake together crumbling the cake into a bowl. Mix about a half to 3/4 of a can of pre-made frosting into the crumbled cake, a couple tablespoons at a time. The mixture should stick together when pressed together in your hand, but not be sticky. Be careful to not over mix the crumbled caked or it will take on the consistency of raw cookie dough. Using a cookie scoop, measure out uniform balls. Gently roll mixture into smooth uniform shapes. Refrigerate balls overnight (at least a couple of hours), or 20 minutes in the freezer. (Don’t leave the cake balls in the freezer too long because the candy coating will crack as it dries once they are dipped). This will make 35-4o balls. Melt candy coating in the microwave at 15 second intervals, stirring each time. Be careful not to get the candy coating too hot because it will get thick. Remove only a few balls from the refrigerator at a time. Dip sucker stick into the candy coating and then stick into the ball. The stick can be placed just past the center of the ball. Sometimes the cake balls get flat on the bottom while cooling. Place the stick in that location. Allow candy coating to dry. 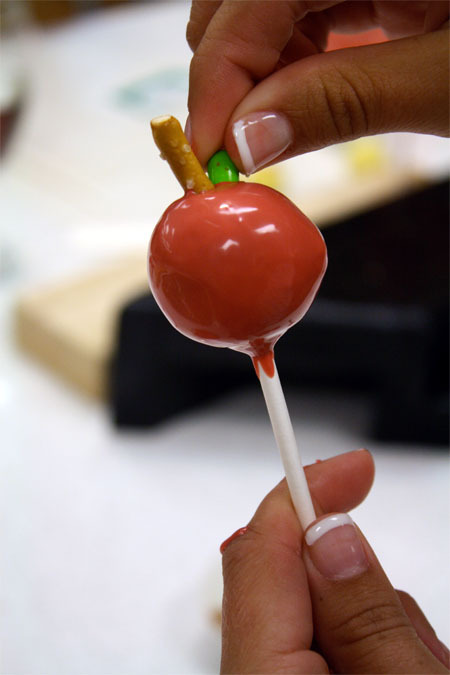 Dip cake pop into the red candy coating. Do not stir or twirl! Rock the cake pop back and forth. Cradle the stick in one hand and tap stick firmly with other hand to remove excess candy coating. Before the candy coating dries add a broken piece of pretzel for the stem and a green tic tac for the leaf. Place sticks in styrofoam or a pre-drilled wood block and allow cake pops to dry. Fill a container with floral foam and some paper shreds, add the cake pops and you have a perfect teacher gift. Very cute ! I will try these soon! Thanks for sharing. Luckily I have just discovered this great website. 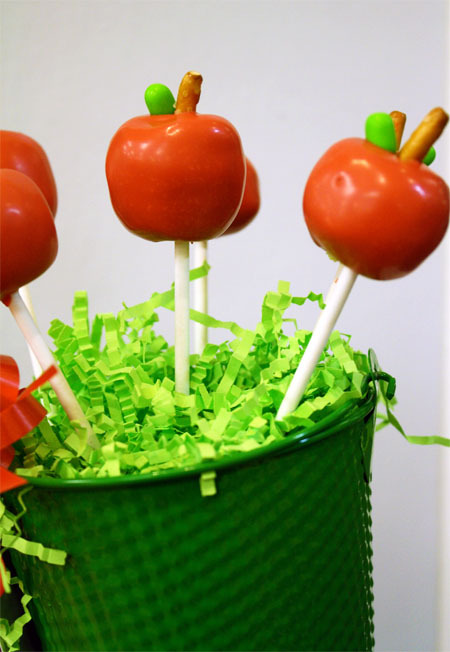 These apple cake pops are amazing, and a great gift to pass out to my neighbors with children as Halloween time draws close. These are so cute! I'm sure I'll never get around to making them, but I am totally wishing I would. They are adorable. Thanks for sharing! I took these treats to a first grade class for Johnny Appleseed week. I ended up using Green Apple jelly beans for the leaves. The candy coating didn't seem thin enough but I was afraid to try and thin it out. Most of them turned out pretty cute! At our school we always consider the source before eating, but generally something cute like this means it came from someplace I'd trust! I have nominated you for the Versatile Blogger Award. You can check out this post to accept! 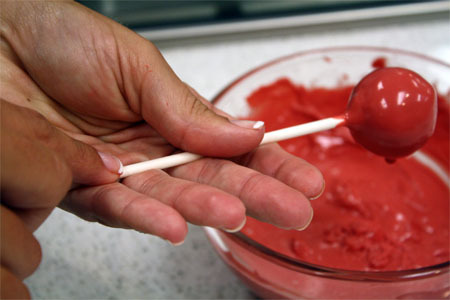 Thank you so much for posting these wonderful tips for making cake pops. I have made one "batch" before but am looking forward to trying again using your instructions to NOT use the whole can of frosting and NOT over working the cake (yes, it does taste like dough if you do). I teach in a large school district. The reason the teachers in my school do not always keep the homemade treats is that it is not always safe. Love these! Such an awesome idea. I teach middle school. We love homemade treats-IF we know you well enough to know that you are a trustworthy, CLEAN person. By this I mean I've probably been in your home and you've been in mine or I've gone to church with you forever. At our school I'm not allowed to make homemade goodies for the kids (don't tell that I am a rule breaker) and they are not allowed to bring homemade goodies. Just think for a moment about everything that could be added to a treat. As I say that, I am forwarding this on to my sister-in-law (another rule breaker) in hopes they'll turn up in our work room. I have yet to make cake pops. Yours are darling. Im going to give it a try soon! How cute! My mom actually just got the cake pop book the other day! We LOVE it! 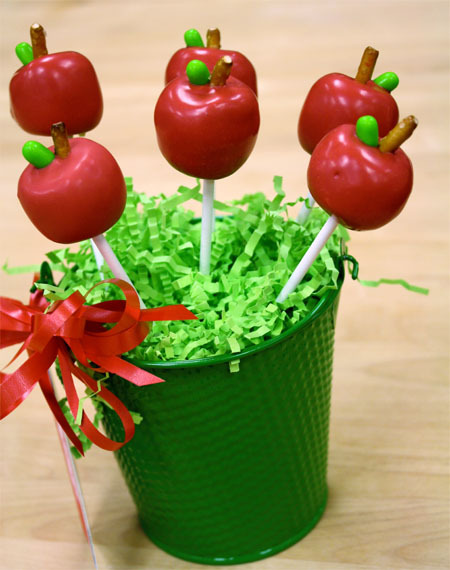 We love these apple cake pops! At our school, the teachers really do appreciate homemade treats. I would think that most teachers would love to receive this darling crop of apples. This is a great tutorial - I cannot wait to make them for our teachers! I had the same idea last week, but mine were a complete disaster. Just wondering...why would they trash almost every homemade goodie? I want to make these wrapped as a welcome back for my 7 year old's class. My sister is a teacher and she said that almost every homemade goodie made for the teachers at her school is thrown away. The teachers will put them in the lounge to be polite and they're trashed at the end of the day. This is her 2nd school and it's the same at both schools. Make them for the kids instead and get the teacher a gift card for a teacher store. Gosh these are so cute! I have been on a bit of a cake pop craze these last couple weeks, this will be perfect for back to school!